Patty Carroll grew up in suburban Chicago, which provides the basis for her work. Her artwork addresses the myths of domestic perfection, through which she creates worlds that critique and satirize claustrophobic expectations that women continue to embrace, in spite of contemporary life and careers. For over twenty years, Patty Carroll has staged photographs using models, drapery, and household objects to add to the dialogue surrounding femininity and the domestic sphere. These not-so-still-lives are colorful, beautiful, mysterious, and humorous, articulating the many complex relationships—both personal and cultural—existing between women and the home. Since the 1900’s “bird” has been used as slang to refer to women, often materially obsessed yet physically beautiful women. 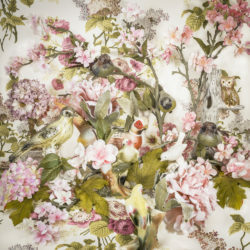 Following the demise of the Anonymous Woman, Patty Carroll has forsaken her mannequins and models and replaced them with birds in “Floral and Fauxna”. Various feathered figurines stand in as a metaphorical substitute. In their natural habitat, birds camouflage themselves in their tree homes, they sing, but remain invisible as they go about their business of feeding, fending off predators and teaching their young. Their camouflage is survival. In these still-life photographs, colorful fabric, artificial flowers and other household baubles create a sumptuous, patterned, and ornate world. This world mirrors the home life of birds in nature while symbolizing the nesting instincts of women whose homes are a sanctuary of pride and obsession. The exhibition opens on Friday, January 11, 2019, from 4:00 p.m. to 7:00 p.m. and ends on February 17, 2019.